Snow removal is a critical winter chore here in central New England. However, businesses must have timely, dependable professional snow removal to minimize any disruption. Simply having a snow plow is not a criteria for selecting a commercial snow removal company. Businesses large and small depend upon timely snow removal in order to stay open, keep employees safe and working, and be able to provide products and services to customers. Without fast and efficient snow and ice removal from business walkways and parking lots, companies lose valuable time and money. At Mike Lynch Enterprises, we take commercial snow removal seriously. We know from experience that effective snow removal is more than just a snow plow on a truck and goes beyond simple sanding and removal. We understand how important it is to stay on top of the fast-changing New England weather so we can be prepared to begin commercial snow plow operations as soon as conditions require it. We even have a full-time mechanic on-site in our local, fully-equipped service garage so we can keep our snow plow equipment rolling for prompt, professional, around-the-clock sanding and removal services, with minimal downtime. Our complete snow removal services include commercial snow plowing for driveways, parking lots and storage/loading areas; as well as salting and sanding. Our experienced snow removal professionals are available twenty-fours a day to keep your business or organization snow-free and operational. We can assist in relocating and removing snow from commercial or industrial sites and even provide emergency residential snow removal in extreme weather conditions. If you own or operate a business, organization or institution, don’t risk losing time and money or jeopardizing the safety of your employees and customers using an amateur or part-time commercial snow plow operator. 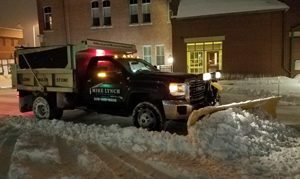 Trust the company in business for over a quarter of a century and the professionals that have built a solid reputation for fast, dependable, competitive and professional snow removal and sanding services – Mike Lynch Enterprises.